What’s a Valentine ranch? Well, perhaps it’s the most unusual gift you can give your sweetie this year. What do you look for in a romantic escape? Surely the must have list includes a destination that’s unique, somewhat quieter and more secluded, in a spectacularly lovely setting (such as California’s Highland Ranch, at left). We found some dude and guest ranch resorts that fill the bill perfectly. All of these are open in February and offer specialized romance programs, packages, or rooms. Wickenburg (50 miles northwest of Phoenix). Isn’t it romantic: It’s the perfect getaway to a slice of the Old Southwest. Rancho de los Caballeros is true resort, with full resort amenities (everything from golf to horseback riding and a spa). Still, if offers up the feel of a cozy bed and breakfast. Retreat for a weekend or longer. Ride or stroll among 20,000 acres of open range in the spectacular Sonoran desert. You’ll feel at ‘home on the range’, as they say at Rancho de los Caballeros. Romantic escape: You may never want to leave the tastefully furnished room, with its handcrafted items, fabrics, and artifacts. Original Ranch rooms capture the flavor of the southwest, while the Maricopa suites are luxurious, each casita featuring a private patio that serves up the tranquility of the outdoors. There’s also a private bath, air conditioning, TV, and telephone with dataport. Package: The Ranch Experience: for those who want to experience all the Ranch has to offer, but still want to have time to savor the peace and quiet of the desert, this four-day/three-night-minimum package includes some time on a horse, at the Spa and on the links. Call the reservations desk for details.Rates starting at $329 Single and $524 Double * Extra Person in Room – Adult $175 / Child (13 or younger) $145. Rates subject to change. Not included: 8% sales tax and 15% gratuity charge in lieu of tipping. Single occupancy rates available. Goleta, California (30 minutes north of Santa Barbara). Isn’t it romantic: Couples might enjoy a local wine from the full bar, taking a dip in the pool, and cozying up in front of the lodge’s stone fireplace. The gals can settle in with a romance novel in a private library, while the guys blow off steam over a pool table, Foosball, satellite TV, or ping-pong. Then get together on a romantic stroll or horseback ride on easily accessible trails on Circle Bar B’s 1100 acres, take a short drive on California’s Coastal Highway 101 to access the Refugio Beach, visit Santa Ynez Valley wineries, or Santa Barbara’s world-class shopping and golf. Romantic Escape: One amazing room features a king bed, Roman tub, hardwood floors, air conditioning, wet bar with coffee maker and fridge, a secluded porch, as well as a welcome basket with chilled champagne and fresh flowers upon arrival. This room sleeps 2 adults only. There are also private cabins, creekside cottages, and deluxe ranch rooms. Above the Anderson Valley, about 2 ½ hours north of San Francisco. Isn’t it romantic: Looking for the perfect Valentine’s Day getaway? Highland Ranch is the ideal place to enjoy an unforgettable weekend full of relaxation and romance, including the featured Winery: Scharffenberger Cellars. Go for a romantic horseback ride through the redwoods to a beautiful vista and then cozy up together next to the fireplace in your cabin. Romantic Escape: Individual cabins are cozy and comfy, with fireplaces and covered porch with rocking chairs. 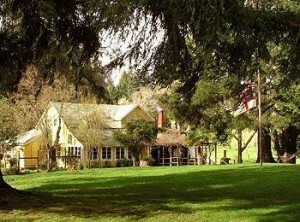 The main ranch house is 110 years old and overlooks an orchard. Valentine’s weekend special: Come stay at the ranch Friday night and get 3 nights for the price of 2. Enjoy a menu of romantic meals fresh flowers and complimentary Scharffenberger chocolate and champagne. Plus, enjoy one FREE massage per couple. Reserve today at stay@highlandranch.com or call (707)895-3600. Argentina (1 hour by plane from Buenos Aires). Isn’t it romantic: Some may look for the stereotypical hot Latin here, but others will search for the romance of history and beauty in an exotic local. The estancia dates from 1574 (in it’s early days, the ranch bred mules for the silver mines in Peru). Today, it is an idyllic retreat for both horse lovers and nature lovers, an organic working farm that breeds Paso Peruano horses and Aberdeen-Angus cattle. Horseback ride with the gauchos, taste wine, watch polo or wildlife, or trek across the Cordoba Hills. Once here, you’re on a farm, where all the accommodations are simple yet comfortable; each room is decorated individually (antiques abound) and each has a private bathroom. On those cooler winter nights, you’re warmed by log fires and wood-burning stoves. What could be more romantic?